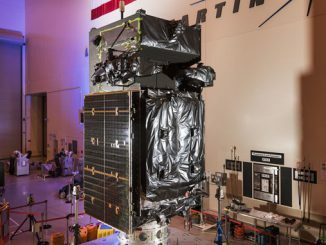 Meteorologists are anticipating favorable odds of good weather during the countdown to launch an Atlas 5 rocket and U.S. military satellite on Thursday evening from Cape Canaveral. 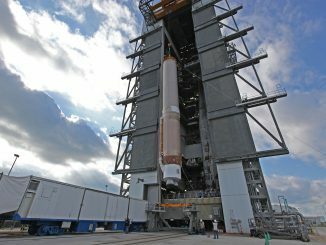 Critical operations were completed this morning by United Launch Alliance at Cape Canaveral to prepare two rockets for upcoming flights into space. 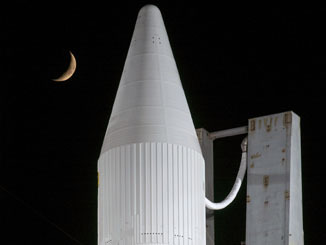 Just two weeks before it flies to space, the core stage of the next Atlas 5 rocket was erected aboard the mobile launcher platform this morning by United Launch Alliance technicians to kick off a streamlined vehicle assembly that will break a record. 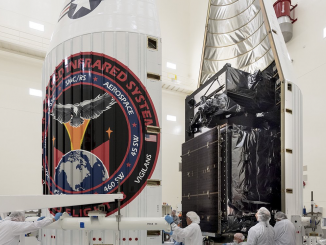 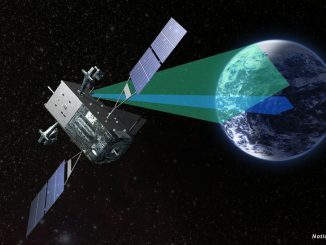 A highly sophisticated U.S. Air Force satellite to sound the alarm when an enemy missile launches has shipped to its Florida launch site for liftoff in October aboard a United Launch Alliance Atlas 5 rocket.